Apple reportedly has plans to return to a metal chassis for at least one of next year's iPhone models, a long-standing design last implemented with the iPhone 7 series in 2016. Citing sources familiar with Apple's plans, Nikkei reports the company is mulling a metal case design for a 6.1-inch LCD model rumored to launch in 2018. "The 6.1-inch LCD model will likely sport a metal back [like older iPhones] that will come in several colors," the person said. The source claims Apple supplier Casetek, a subsidiary of Pegatron, would likely win orders for the LCD iPhone. Casetek already handles production of aluminum cases for iPad, and the general design of next year's iPhone could be similar — a shallow metal frame into which operational components are laid. A separate source also notes Casetek has been experimenting with new casing designs for the 2018 LCD iPhone. If the firm is able to finalize a suitable production process, it could link up with parent company Pegatron in fulfilling whole iPhone orders, according to an industry executive cited by the publication. The situation would be similar to that of Foxconn, which boasts its own metal parts production unit. One of the sources reconfirmed rumors that Apple is looking to debut two new OLED handsets in 2018. The report claims one OLED iPhone model will run 6.2 or 6.3 inches long, while the other will be 5.8 inches. Nikkei likely misinterpreted the information, however, as Apple will likely introduce a larger OLED model alongside a successor to its 5.8-inch iPhone X — measured on the diagonal — next year. That means the new, larger OLED model will boast a display measuring 6.2 or 6.3 inches on the diagonal. 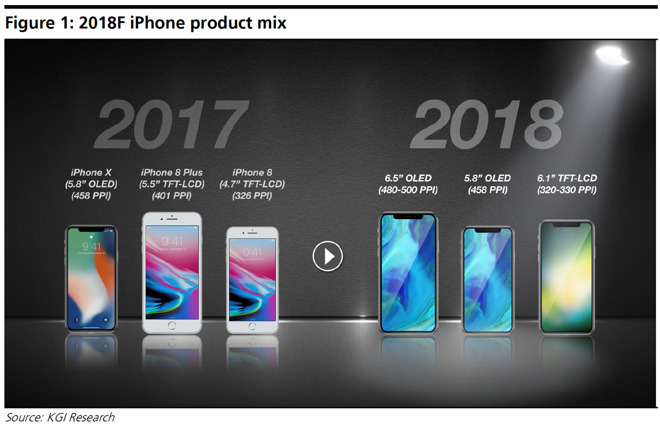 Today's rumors are in line with predictions from noted KGI analyst Ming-Chi Kuo who last month revealed Apple is working on a lineup of three iPhone models for 2018. In a note to investors, Kuo said the company will release a next-generation 5.8-inch iPhone X and a plus-sized variant with a massive 6.5-inch OLED screen. The analyst also made note of a 6.1-inch LCD model that will "differ significantly" from its OLED siblings. According to Kuo, Apple is looking to incorporate a lower resolution display to achieve a comparatively low price point between $650 and $750. Still, the low-cost model is expected to ditch Touch ID for Apple's TrueDepth camera system and Face ID, meaning the company will be able to greatly reduce bezel size.